Sometimes, it’s the smallest tools that make the biggest difference. As the story goes, a man married for over 18 years never smiled at his wife, or at anyone, for that matter—a real grouch. When asked to make a speech on his experience with smiles, he thought he would try it for a week. He reported that in greeting and smiling at everyone, from his wife to people in stores and elevators to employees and vendors, he found people smiling and communicating back. He even found himself communicating while smiling at people with complaints. This little detail drastically changed his life. We at 90 Degree Office Concepts believe that creating a pleasing, modern, likable meeting environment can provide an internal and external smile for everyone you meet with. The Zabano Modern Conference table and Credenza are pieces that will elevate the mood of any meeting room. The Zabano Modern Conference Table and Credenza offer you an extremely unique design experience. The bidirectional wood grain offers a different design than the one frequently used in directional table grains. The base table legs form a straight edge on the outside base and a concave configuration at the center, where two opposing legs face each other. The center surface color is optional. The Zabano modern Conference Table and Credenza set is available in an array of colors and wood species. Select the color that best matches your color palate. 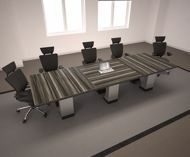 This contemporary conference table can be constructed to suit for your room size and shape, from 72" and up. That’s because all of our furniture is not standard off-the-shelf; instead, it is built for just you. Just ask your design consultant for any help you need to get the perfect fit. The Zabano Modern Conference Table and Credenza are available in HPL, and in many wood species with a pronounced grain. Our entry-level material is HPL, which upgrades to maple wood and veneer. It is also available in walnut, mahogany, sapelli, cherry, and oak. This process offers you complete flexibility to match the look and feel with your budget. Need assistance understanding material differences? We can help! Got a budget you need to fit? Let us help you size things up. Our team gets it! We understand relationships between price, material, and design differences, and we can help you match price with the durability and visual impact you want to create. The Zabano Modern Conference Table shown is sized at 120" x 42" x 31"H, and is designed with 1-1/2" thick top. It is constructed of and finished in zebra wood.